200 mph Pro Modifieds combine with Muscle Cars of all generations for wild 275 Radial racing, Big Tire Outlaws, HUGE Car Show, and Manufacturer's Midway as the NMCA Muscle Car return to Memphis where Worlds Fastest Street Cars all Began. 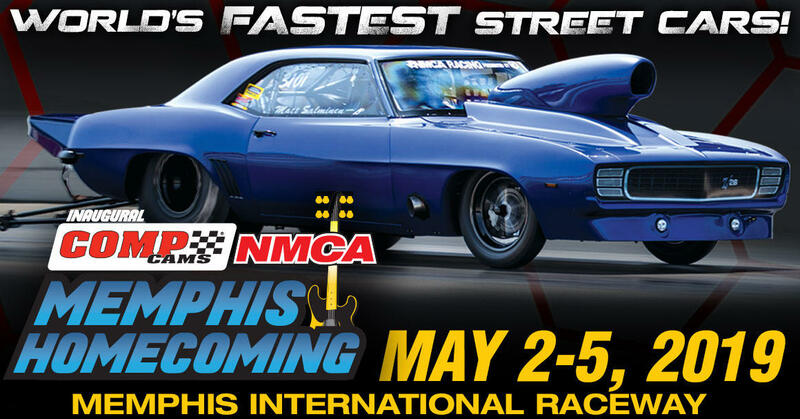 The NMCA will make a return to Memphis International Raceway thanks to facility upgrades as its bringing the spirit and excitement of street-legal drag racing back to its home. The drag competition and car show event is being dubbed The Memphis Homecoming and it is happening May 2-5, 2019. The history between the organization and the race track goes back to 1992 when Hot Rod Magazine selected Memphis International Raceway as the destination to host its inaugural street race shootout, bringing a growing phenomenon into national spotlight. The Top 10 Shootout ushered in a new genre of drag racing and it still thrives 27 years later. Be sure to check out the Manufacturers Midway all weekend long with the hottest deals on parts for your muscle car, race car, late-model street car. The All-American Car Show om Saturday & Sunday features early- and late-model Chevys, Fords, and Mopars as they compete for hundreds of custom awards and major bragging rights! If you have a street legal ride, the Gear Vendors True Street class is open to anyone with the desire to go fast. After a 30-mile cruise on Saturday, all True Street cars get three consecutive runs down the quarter-mile for the chance to win 9 different prizes. Register on the NMCA website if you have a late-model HEMI vehicle or LS-powered street car for FREE entry into competition! Visit www.NMCAdigital.com/FL for more information. The Aerospace Components Winners Circle is the biggest party of the weekend as we celebrate event champions with Edelbrock Victor award presentations, adult beverages, and photo shoots of the winners.